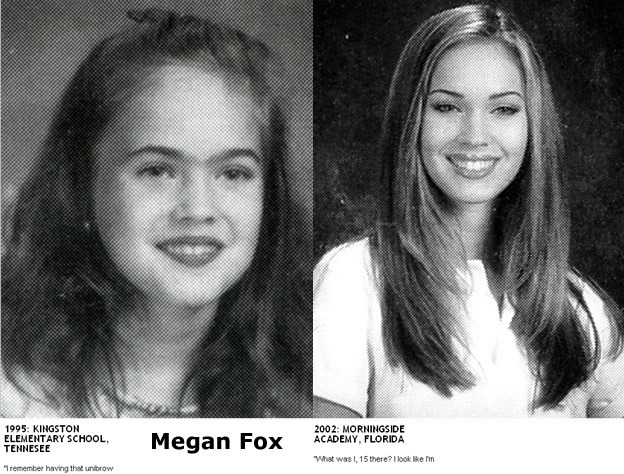 Megan Fox 9 years old: I remember having that unibrow, which I always hated. I used to beg my mother to let me pluck my eyebrows. It’s an old wives’ tale that babies born with unibrows are destined to be famous, and when I was born, my grandmother looked at my mom and said: This baby’s going to be famous. I believe I was ten when my mother finally let me pluck into the unibrow. Megan Fox 15 years old: What was I, 15 there? I look like I’m attempting to pull off a Carmen Electra look. I will say for people who question the authenticity of my lips, you can clearly see that my lips are my lips. I don’t know. I did a pretty good makeup job there for a 15-year-old. BTW, at 15 Megan was already acting, we posted some videos about it.